Stanford now joins the University of Richmond and Massachusetts’ Hampshire College as the only schools in the nation capable of entirely offsetting their electricity usage with solar. The University of Hawai’i and University of California systems have both got in the mix as well, making 100% renewable energy a near-future goal. Additionally, Duke Energy supplies the University of North Carolina system with 250MW of renewably-generated electricity each year as a part of its Green Source Advantage Program. 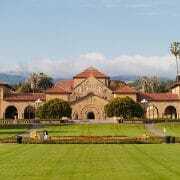 Stanford University to become 100% solar powered, by Tim Sylvia, PV Magazine, December 4, 2018.